DORAVILLE, Ga. — Dr. Nadine Becker wasn't politically involved until she saw Donald Trump elected president, but the suburban Atlanta gynecologist didn't know how to engage, given her traditionally Republican surroundings. "I was yelling at the TV and throwing things at the TV," recalls the 55-year-old mother of three. Then she found her cause in 30-year-old Democrat Jon Ossoff, who is aiming for a major upset in Georgia's 6th Congressional District runoff Tuesday against Republican Karen Handel. With a potential price tag exceeding $50 million, the most expensive House race in U.S. history has become a proxy for the nation's political divides, offering another early test for Trump and the GOP's monopoly in Washington. And it gives Democrats a chance to prove they can flip at least 24 GOP-held seats and reclaim a House majority in the 2018 midterm elections. "My values are being threatened," Becker said, mentioning health care access, abortion rights and voting rights, "and now we have something we can do." Business owners Brian Sleeth and Dave McCleary are equally appalled, but for reasons that leave them backing Handel. "This is about who will support Donald Trump and his agenda," says Sleeth, a 37-year-old landscaper from Johns Creek, Georgia. "Karen Handel says she will, and we look forward to holding her accountable." For McCleary, 58, it's less about Trump. The Roswell, Georgia, resident sees Ossoff as a charlatan, campaigning as a moderate but certain to become a marionette of his national party. "He's a phony. I think he's been coached up," says McCleary, arguing Handel would cast reliably conservative votes. Those are some of the rationales that could ultimately settle what both campaigns agree will be a close race, despite Republicans holding the seat since 1979 with representatives from Newt Gingrich, the eventual House speaker, to Price. The seat opened in February when Price resigned to become Trump's health and human service secretary. 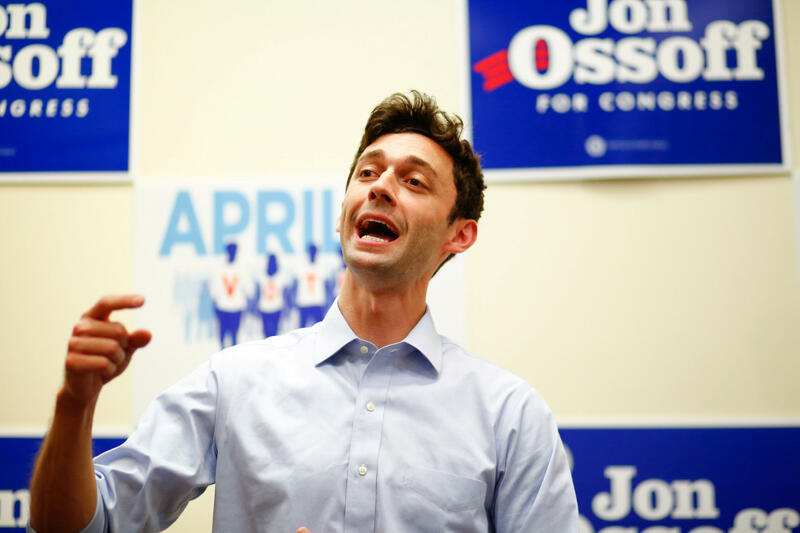 Ossoff, who led April's first round but fell shy of outright victory, gamely insisted that "this is about the folks right here in Georgia." Handel, 55, said it's about choosing her record as Georgia secretary of state and commission chairman of the state's most populous county over the resume of a former congressional staffer and documentary filmmaker who's never held public office. "My opponent likes to talk about it," she says. "I've done it." But the national attention — and all the money — tells another story. And the attention is all the more intense given Republicans held on to House seats in Montana and Kansas earlier this spring and are expected to hold a South Carolina seat on Tuesday. Ossoff's television ads mostly frame him as a centrist who criticizes both parties in Washington for "wasteful spending" and promises to focus on developing metro Atlanta's economy. He's also taken aim at Handel as a "career politician" and an executive for the Susan G. Komen Foundation when the organization threatened to cut off funding for Planned Parenthood, a health care and abortion provider. But he's financed that message with a fundraising haul from outside the district, and his donor list contains far more addresses from California, New York and Massachusetts than from Georgia. For Handel, Ossoff's "values are 3,000 miles away in San Francisco," the hometown of House Democratic leader Nancy Pelosi. But Handel also has benefited from millions in out-of-state spending. A political action committee backed by House Speaker Paul Ryan spent $7 million on her behalf, and the GOP's House campaign committee about $4.5 million. Despite their emphasis on local matters, the candidates have generally aligned with their national parties on policy. She says she'd have voted for the House GOP health care bill; he says he'd have opposed it. She broadly endorsed Trump's loose outlines for tax cuts; he's said any plan must be "fiscally responsible." He supports a higher minimum wage, with caveats; she's opposed. The two campaigns expect turnout to blow past the 2014 midterm election turnout of 210,000. More than 140,000 people cast ballots in the early voting period that ended Friday, compared with a total primary turnout of about 192,000. Republicans anticipated far higher early turnout among reliably Republican voters — Georgia voters don't register by party — while Democrats point to thousands of ballots cast by newly registered voters and those who didn't vote in April. The reality, says Ossoff backer Dodoo Saakwa-Mante, is that no one knows who'll win or what it actually means for Washington. "I think he can win," the Doraville, Georgia, Democrat says at an Ossoff rally. "But I don't know. We've never had a candidate like him to get excited about here."